There are currently two tests used throughout the corrugated industry to determine strength. Historically, the long time industry standard has been the Bursting (Mullen) Test, which is related to the rough handling durability of corrugated material. Bursting Test is a measure of the force required to rupture or puncture the face of corrugated board and is measured by a Mullen Tester. This force is indirectly related to a carton’s ability to withstand external or internal forces and thus to contain and protect a product during shipment. Bursting strength is reported in pounds (for example, 275#). A newer standard that has achieved widespread acceptance is the Edge Crush Test (ECT). This is a true performance test and is directly related to the stacking strength of a carton. ECT is a measure of the edgewise compressive strength of corrugated board. It is measured by compressing a small segment of board on edge between two rigid platens or plates perpendicular to the direction of the flutes until a peak load is established. This is measured in pounds per lineal inch of load bearing edge (lb/in), but usually reported as an ECT value (for example, 44 ECT). Here it is important to point out that the equivalent ECT values are give as a minimum value. This is because corrugators may use one of many different “recipes” to make each type of corrugated. Each makeup will vary slightly in overall strength. For example differing formulas for a 200# single wall corrugated will cause the equivalent ECT board to vary between 32 ECT and 44 ECT. It is important to understand what type of corrugated you are using before deciding to substitute any equivalent. For example, if you are shipping a product that weights between 25-40 pounds, a 32 ECT single-wall carton should be sufficient, in most cases. If your carton is going to be subjected to severe handling, the 200# carton might be a better option. It would be equivalent to a carton with an ECT of 32 or higher, and the bursting test is more of a true measure of rough handling. The fundamental difference between the two tests is that under the Burst Test a minimum board basis weight is required. That is, the Burst Test requires that the base papers used to make corrugated fiberboard weigh at least a certain minimum number of pounds per given unit area. The ECT eliminated this requirement, which allows the use of lighter weight materials while still providing high performance. When you are comparing two identically sized cartons with equivalent strengths, one being Burst Test rated and one being ECT rated, the ECT rated carton will weigh less. In other words the ECT rated carton will use less corrugated material. For example compare a 275# single wall to an equivalent 44 ECT single wall corrugated board. On average, the 275# Burst Test rated single wall carton will weigh 175 pounds per 1000 square feet of material used. An equivalent 44 ECT rated single wall carton will weigh on average 149 pounds per 1000 square feet of material used. The 44 ECT board will reduce the material used by 14.8%. Put differently, the proper ECT rated corrugated provides an equivalent level of strength, but uses less material. This translates into fewer raw materials, lower energy requirements, and reduced pollution, in all stages of the package’s life cycle. 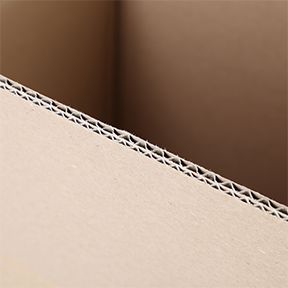 Combining lighter materials in a properly sized carton with increasing amounts of recycled content means ECT rated corrugated reduces waste even further.